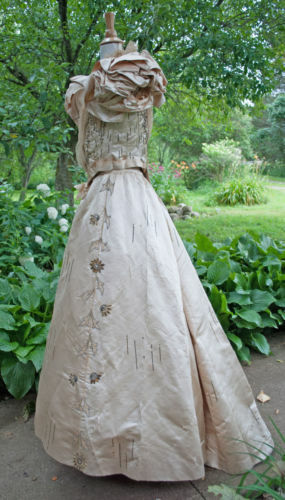 This is an attractive FRENCH Reception Dress gown of the 1880's period, that a mid to upper class woman would wear. A regal trained 2-piece in construction ivory satin gown/dress lavishly decorated with gold and crystal beadwork, gold sequins and colored faceted stone jewels paillettes. Gown comes with it's original beaded pumps. Labelled HELLSTERN & SONS, BREVETES, PARIS. Labeled on petersham. Reads A. FELIX, PARIS, see photo for details of label. The front of bodice is decorated lavishly and skillfully done with beadwork and having floral tambour lace inserts. Bodice has cap sleeves with double oversized ruffles.The bodice has hook and loop front closure fastening with a tight fitting bodice. Bodice comes to a point in front and back. 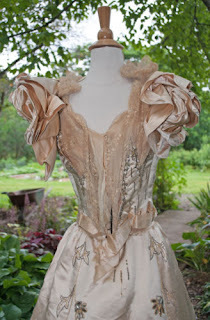 The bodice is lined with cream silk and has 10 fabric covered whale baleen stays. No underarm discoloration. The skirt closes by hooks and loops at back and gathers with pleats in the center back with fullness for a nice fall with very long train. The skirt is lined with a tan satin. 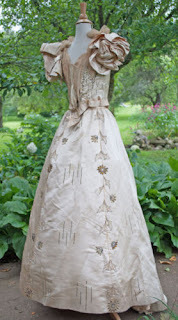 Shoulder to waist with point 20", Shoulder to waist at sides 18"
Condition: The gown is in fair/poor condition. Satin is shredding in skirt and in bodice. No underarm discoloration, but has large underarm tears. I do not see any bead loss, but lets say there is a few lost beads. Some light surface soiling at hemline. Bodice lining is fair with shredding, skirt lining is poor with shredding. 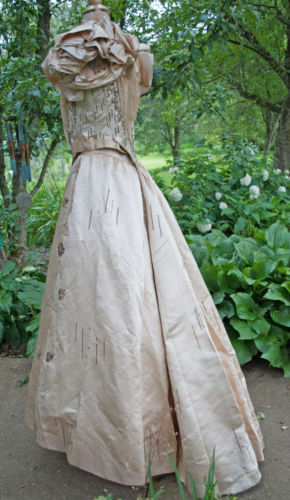 The skirt is in poor condition with many split tears to material as shown in photos. Shoes are in fair/good condition with satin splitting, and minor bead loss. I have described this gown as fair/poor, for the collector who looks for perfection, I believe it should be rated fair condition in my opinion. A truly grand display dress/gown for display. Antique clothing should not be worn. This gown is a good 15 years, if not a bit more, than 1881. The sleeves are too puffy and there isn't the form fitting skirt you'd expect with the natural form in the early 1880's. Rather, this is the later 1890's - probably 1896-1898. Really, it has a lot of remarkable similarity with this gown at the Met other than this extant gown has puffier sleeves. The skirts are the same shape and the embroidery placement is pretty similar.